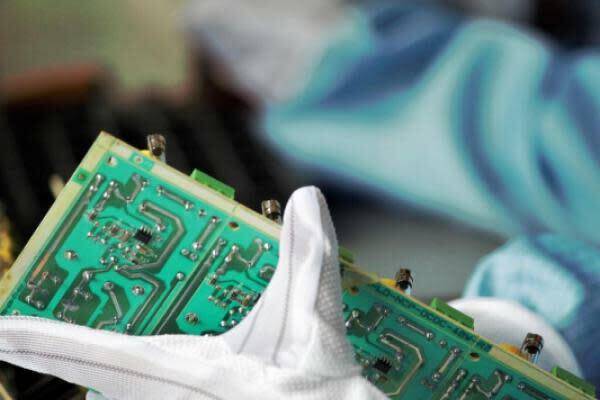 Marvell Technology Group Ltd. (NASDAQ: MRVL) reported fourth-quarter results that were mostly in-line with management's preannouncement but first-quarter guidance fell short of expectations. MKM Partners' Ruben Roy maintains a Buy rating on Marvell Technology with an unchanged $25 price target. Bank of America's Vivek Arya maintains at Buy, unchanged $24 price target. Morgan Stanley's Joseph Moore maintains at Equal-weight, unchanged $19 price target. Marvell's fourth-quarter revenue of $745 million came in near the high-end of management's guide but was down 12.5 percent from the prior quarter, Roy said in a research report. The drop in revenue is mostly attributed to weakness in the storage business where demand for storage controller products came in worse than forecasted. Networking revenue also fell short of estimates although embedded processes, 4G and pre-5G wireless infrastructure revenue came in as expected. Ethernet switch and PHY product sales rose from last year, but still fell short of management's expectations. Non-GAAP gross margin of 64.5 percent fell short of management's guidance due to the lower than expected revenue even though non-GAAP operating expenses of $286 million was at the lower end of management's original guidance. Management remains on track to ramp 5G products with its lead customer Samsung by fourth quarter, Arya said in a research report. This should be seen as a positive as it could add $50 million to fiscal 2020 revenue and ramp to $150-$200 million in fiscal 2021 and as much as $250-$300 million afterward. Arya said the company has multiple product cycles in the pipeline, including Wifi (802.11ax or Wifi6) and high-end switching and servers (Thunder X2/3). Coupled with expectations for the Cavium integration to achieve $50 million in COGS synergies, the company should be able to show margin expansion from 27.6 percent in 2018 to 30 percent in 2020. Management guided April quarter sales to be $650 million, which is notably below the Street's estimates. Moore said the storage segment is likely to decline by a mid-teen due to ongoing weak demand and networking sales will likely fall 10 percent sequentially. Management said revenue for both storage and networking will trough in the first quarter which implies the potential for a rebound to growth in the back half of the year, the analyst wrote. Even if the business bounces back "fairly quickly," the company still faces challenges in storage and investors may want to become constructive on a meaningful pullback. Marvell Technology traded lower by 3 percent at $18.58 per share Friday afternoon.